The Ways and Means Committee has compiled a fine book with an impressive collection of recipes just in time for holiday giving. The cookbook is being sold for $10 at the Museum. Please note that you can also purchase it at our generous bookstore here in town I Love Books. We appreciate the support of all those who contributed recipes and helped to get this book together. The Cedar Hill Schoolhouse Museum, home of the Bethlehem Historical Association, is open Sunday afternoons from 2 to 4 PM May through October, before and after meetings and by appointment. BHA presents programs on the third Thursday of the month from September through April at the museum and at the Delmar Reformed Church. A complete schedule is found on the Events & Activities page. To further connect with the Bethlehem Historical Association, please like us on Facebook. PS We hope you enjoy the above before and after photos of the Cedar Hill Schoolhouse. The lower one was taken by photographer Gary Gold in July 2018. The Cedar Hill Schoolhouse Museum is open Sunday afternoons from 2 to 4 PM beginning May 5, 2019. Stop by for a visit. Free and open to the public! Dates for 2019 Cemetery Walks and History Paddles just added. Click on History Hikes tab above for info. Followed by a selection of tea sandwiches and fancies. "A perfect time to show off one of your favorite hats!" More info from Vintage Visitor : “Topping it Off- Vintage Hats and the Heads that Wore Them” Phyllis Chapman presents a lighthearted frolic of vintage hats and headgear of men and women. So much more than mere headcoverings, they have been flirtatious, subdued, dignified, businesslike, extreme, and even ridiculous (more than once!) This fun romp through millinery and haberdashery includes reproduction and vintage Victorian and Edwardian hats for the audience to try! Archaeologist Lisa Anderson discusses her recent work in her presentation Skeleton Stories from Colonial Albany. Dr.Anderson is the curator of Bioarchaeology and NAGPRA Coordinator for the New York State Museum. She is the project manager for the Schuyler Flats Burial Ground project. Please note the time and location of this talk. We are back at the schoolhouse, 1003 River Road, Selkirk, at the corner of Clapper Road. As always, free and open to the public. Conversation and refreshments after the talk. Red Cross. Less is known about her accomplishment as an educator, or that she was one of the first women to hold a salaried US government position in the Patent Office in Washington, DC. When the Civil War began, she was one of the first to recognize the essential and far-ranging support systems that would be required for soldiers in camp and on the battlefield. After years of advocacy, Barton persuaded the United States government to sign the Geneva Treaty and form the American Red Cross, which continues to support those in times of disaster and need. Phyllis Chapman, dba “Vintage Visitors”, will personify Barton in period correct costume, and speak in the first person. Excerpts from Barton’s field diaries, period photographs and on-site photos of areas where Barton lived and worked, along with reproduction medical artifacts used in the care of the wounded are included in the presentation. Chapman has been doing living history presentations for over 15 years, and has a Master's Degree in Education from the Massachusetts College of Liberal Arts, and in Museum Education and Arts Administration from Skidmore College. She personally researches each character in depth, and has visited many of the sites where these remarkable women lived and worked. Along with her husband Mike, Chapman presents multi-media programs for historical societies and historic sites, libraries, retirement communities, and historical organizations. The presentation is free and open to the public. Conversation and refreshments after the talk. Above: Portrait of Clara Barton in 1881, the year she established the American Red Cross. (RedCross.org) Below: Phyllis Chapman in character as Clara Barton. Bielinski’s presentation identifies relevant themes, raises pertinent issues, and places Albany within larger historical contexts. It calls on the best historic and recreated images of life in the pre-industrial city and is accompanied by the engaging “Albany ~ a song of Community.” The program quickly becomes interactive as audience members rarely resist commenting and soon are asking questions about individual lives, how people lived, and about the shape and structure of the city of Albany 200 years ago. Stefan Bielinski is the founder and emeritus director of the Colonial Albany Social History Project at the New York State Museum. For more than forty years, he has been a student, teacher, and advocate of the "history of the people, by the people, and for the people" approach of the community historian. FREE and open to the public! Refreshments and conversation after the talk. On Thursday afternoon, January 17, the Bethlehem Historical Association is pleased to present Charles Gehring’s talk The People of Beverwijck. Gehring has designed his presentation as a walking tour of the village of Beverwijck circa 1655. Street patterns, architecture, trades and daily events (such as the baker’s announcement of fresh bread and the herding of cows to pasture) will all be highlighted and put into context of the fur trade. Beverwijck is the early predecessor of the city of Albany. Charles Gerhring is widely recognized for his outstanding work on early Albany area history. He was born in Fort Plain, an old Revolutionary War and Erie Canal village in New York State’s Mohawk Valley. After completing his undergraduate and graduate studies at Virginia Military Institute and West Virginia University he continued post-graduate work with assistance of a Fulbright grant at Albert-Ludwigs-Universität in Freiburg, Germany. There he began his study of the Dutch language and first realized that his future research lay much closer to home. In 1973, he received a PhD in Germanic Linguistics from Indiana University with a concentration in Netherlandic Studies. His dissertation was a linguistic investigation of the survival of the Dutch language in colonial New York. He is presently director of the New Netherland Research Center (sponsored by the New York State Education Department). The Center is responsible for translating the official records of the Dutch colony, promoting awareness of the Dutch role in American history, and providing a center for research in New Netherlandic studies. He has been a fellow of the Holland Society of New York since 1979. In 1994 Her Majesty Queen Beatrix of the Netherlands conferred on him a knighthood as officer in the Order of Orange-Nassau. He has received gold medals from the Netherlands Society of Philadelphia, the Holland Society of New York, and the St. Nicholas Society of New York. We had a great time on a very cold morning - about 30 people showed up! Thank you to all who helped put this together, especially Dawn and Kathy for having hot chocolate and hot coffee ready when we got back to the schoolhouse! Join Town Historian Susan Leath and bundle up for a brisk winter history hike around Henry Hudson Park. See what the leaves on the trees have been hiding all summer long like the Nicoll Sill House and Follywyck. After the walk we will adjourn to the nearby Cedar Hill Schoolhouse Museum (home of the Bethlehem Historical Association) for warming drinks and an informal slide show of Cedar Hill and Hudson River history. Meet near the large picnic pavilion at 10 AM. Check back here for weather related cancellations, BethlehemHistorical.org. The Bethlehem Historical Association invites one and all to celebrate the holidays at the Cedar Hill Schoolhouse Museum. This year our talented team explores the theme “Over the River and Through the Woods” in their Christmas decorations. Come and experience the museum as you’ve never seen it before at one of the following events. All are free and open to the public. Sunday, December 2 from 1 to 4 p.m. is our Annual Holiday Silver Tea. A BHA tradition for over 30 years, enjoy sweets and treats and, of course, hot tea and coffee. Stop by Monday, December 3 from 3 to 7 p.m, or Sunday, December 9 from 1 to 4 p.m. for our Holiday Open House. Sweets and treats and festive punch combine for an enjoyable afternoon. The Cedar Hill Schoolhouse Museum is located at 1003 River Road, Selkirk. The three eldest Schuyler sisters, Angelica, Eliza, and Peggy, have been causing quite a stir on Broadway in Hamilton: An American Musical, but did you know that there were really five sisters? Jessie Serfilippi’s presentation The Schuyler Women is an in-depth look at the history of the Schuyler women, their daily lives, and the impact they had in shaping their family's history. Jessie Serfilippi is an interpreter at Schuyler Mansion State Historic Site. She gives general tours of the house on a daily basis, as well as two focus tours, "When Alexander Hamilton Called Albany Home" and "The Women of Schuyler Mansion." She also performs research and writes for the site blog. Past articles have included "Schuyler Sisters Land Squabble," "Inquire of the Subscriber at Rhinebeck: Philip Jeremiah Schuyler and Slavery," and "The Cost of Comfort: Philip Schuyler's 1761 Expenses." Her current research is focused on uncovering more information about the men, women, and children enslaved by each generation of the Schuyler family. She will graduate from the College of Saint Rose this December with an MFA in Creative Writing. All welcome! Refreshments and conversation after the talk! The bedrock of New York and its erosion created the landscape where the Iroquois peoples made their home. It influenced their territorial boundaries, defenses, settlement patterns, trail systems, agriculture, and use of key resources. Dr. Ver Straeten’s talk explores these connections in his talk Geology, Landscape and the Iroquois Homeland. Chuck Ver Straeten is Curator of Sedimentary Rocks at the NYS Museum. Dr. Ver Straeten investigates the state's deep-time history during the Devonian Period between 420 and 360 million years ago including ancient environments, sea level changes, mountain building and explosive volcanism. He is a down to earth, entertaining speaker who balances his academic life with his other passion as a musician. Free, open to the public, museum open at 6:30 PM, refreshments! Join us! We had a wonderful evening, made a little money for BHA and were all inspired to make beer! Beer was a vital part of our local history, if not in Bethlehem, certainly in nearby Albany, originally known as Beverwyck. The first Patroon, Kiliaen van Rensselaer himself, was all too aware of the importance of beer. He wrote in June 1632, “As soon as there is a supply of grain on hand, I intend to erect a brewery to provide all of new Netherland with beer, for which purpose there is already a brew kettle there…” Beer brewing and drinking in the 1600s only grew from there! Learn more of this vital history, and enjoy a cold brew at the same time, at our Beer and Pretzels fundraiser. Educator, local historian and beer enthusiast Richard Muggeo will share his insights during his talk Beer, Brewers and Beverwyck. 2018-2019 Speaker Series is here! Click on the Events & Activities tab above for the complete list. Museum NOW open Sunday afternoons thru October 28! The Cedar Hill Schoolhouse Museum opens for the season on Sunday May 6. Regular hours will be Sunday afternoons from 2 to 4 pm through October 28. Currently, two exhibits are featured. One presents more than a dozen wedding dresses from our collection including examples from the 1860s through the mid-20th century. Wedding related items from the Clapper, Blessing, Myers, Haswell, Babcock and Mosher families are also be featured. Another plots all of Bethlehem’s 15 one-room schools on an 1866 map and includes photos of students as well as the buildings, several of which are still standing today. Mark your calendars for our annual Ice Cream Social on Sunday June 10. This year we are celebrating Bethlehem's 225 anniversary! Tours are free, but please pre-register with the Town of Bethlehem Parks and Recreation Department. Wear your walking shoes. Walks are usually rain or shine. If there is unusual weather and a cancellation is necessary, visit BethlehemHistorical.org the morning of the walk for information. For more information, please contact Susan Leath, Town Historian, sleath@townofbethlehem.org. On September 30, 2018 from 2-4 pm, the Bethlehem Historical Association Museum will host another "pop up" centering on the concept of "then and now." Two former educators will display artifacts from long ago and ask visitors to match these items with artifacts/pictures of current comparable items. They will also have some toys from yesteryear for visitors to play. Join us for an afternoon of educational fun and tour the museum which proudly displays the Town of Bethlehem's history! POP UP history events are held during regular museum hours from 2 to 4 PM. There is no charge, either for admission or the activities. We'll be adding more as they POP UP! On Thursday evening September 20 at 7 PM, the Bethlehem Historical Association presents Mohicans in Bethlehem History and Today, a talk by Bonnie Hartley, Tribal Historic Preservation Officer of the Stockbridge Munsee Community. Mohican people are the indigenous people of the Mahicannituck, the waters that are never still, now known as the Hudson River. The presentation will discuss Mohican history in the Bethlehem area including sharing local artifacts. The talk also emphasizes the work that the contemporary tribal nation, the Stockbridge Munsee Community, now based in Wisconsin, is doing today to protect important sacred and cultural sites in the region. Bonney Hartley is a member of the Stockbridge Munsee Community and since 2014 has served as Tribal Historic Preservation Officer from the tribe’s traditional homelands here in the Hudson Valley. She is based in an extension office in Troy, New York and works to protect Mohican and Munsee cultural sites such as burial grounds and village sites that are important to the tribe’s heritage. She holds a Masters’ Degree in Social Science- International Relations. Museum doors open at 6:30 and the free talk will be followed by refreshments. All welcome! Happy Birthday Bethlehem! 1793-2018 225 Years! Join us on Sunday afternoon June 10, from 1 to 4 pm at the schoolhouse, as well celebrate 225 years of the town of Bethlehem with our annual Ice Cream Social. Free and all are invited!! There will be cake! 2018 has been a rainy time for history paddles. Unfortunately, between the tides and other commitments, Town Historian Susan Leath cannot schedule any more dates this year. You are welcome to email her directly and she can send you a self guided tour. sleath@townofbethlehem.org. History paddles will be back in 2019! Thursday, April 19, 2018 7 PM at the Cedar Hill Schoolhouse Museum, 1003 River Road Selkirk. Thursday, April 19 at 7 P.M. the Bethlehem Historical Association presents the lecture Images of Childhood 400 Years Through Time by Marilyn Sassi. Sassi’s illustrated talk focuses on the late 16th through the early 20th century, and covers many aspects of a child’s life with comparisons of between the working classes and the wealthy and the English and Dutch. Marilyn Sassi is currently an adjunct instructor at Schenectady County Community College and Hudson Valley Community College. She has also presented series for U-Call at Union College. She is the past curator of the Schenectady County Historical Society, the Fulton County Museum and the Van Alstyne Homestead Society. In addition to her teaching and museum experience, she has had many years of involvement in the field of antiques. The talk is free and open to the public and takes place at the Cedar Hill Schoolhouse Museum 1003 River Road, Selkirk. Enjoy refreshments and conversation afterwards. You are invited to an Afternoon Tea featuring Connie Frisbee Houde's talk Wedding Dresses and Their Stories followed by an elegant tea service with sandwiches and fancies. In addition, more than a dozen wedding dresses from the our clothing collection will be on display including examples from the 1860s through the mid 20th century. Wedding related items from the Clapper, Blessing, Myers, Haswell, Babcock and Mosher families are included. Reservations are requested by April 4th. Cost is $20 per person with checks payable to Bethlehem Historical Association 1003 River Road Selkirk, NY. Contact BethHist1965@gmail.com if you have questions. All funds raised are in support the storage and display of our collection. Place: Cedar Hill Schoolhouse Museum, 1003 River Road, Selkirk. Come to the Bethlehem Historical Association’s Cedar Hill Schoolhouse Museum on March 15 at 7 pm and experience Phyllis Chapman’s first-person portrayal of Lucy Larcom. In 1835, at age 11, Larcom began work as a doffer at the Lawrence Corporation mill in Lowell, Massachusetts. Through the lens of Larcom’s experience, Chapman explores the inside workings of the early 19th century textile industry. Phyllis Chapman has been a museum educator and living history presenter for over 15 years. She served as the Director of Education at the Bennington Museum, the Site Coordinator for the Bennington Battlefield Visitors' Center, and also as Curator of Fine Arts at Siena College in Loudonville, NY. Through “Vintage Visitors” , she presents first-person costumed portrayals of notable women in American history. Incorporating artifacts and audience participation, her programs tell the stories of women such as Clara Barton, Susan B. Anthony, A New England Mill Girl, and several others. She also has an extensive collection of reproduction historic womens' and girls clothing and has presented historic fashion shows at the Park-McCullough House, the Barnett Homestead, and historical societies, and other non-profit organizations. The event is free and open to the public. Refreshments and conversation to follow the talk. Stuart Lehman explores the sensational murder of Mary VanDusen Hendrickson in his talk Aconite and Agony: A Tale of 19th Century Medicine in Bethlehem, New York. The killer’s trial, which happened in Albany in 1853, featured one of the first uses of forensic science. Join us on Thursday, February 15, 2018 at 2 PM at the Delmar Reformed Church, 386 Delaware Avenue, Delmar. Free and open to the public with refreshments to follow the talk. Coming up in March is a first person presentation by Phyllis Chapman: Lucky Larcom: New England Mill Worker, Thursday March 15, 7 pm, at the schoolhouse. Albany artist David C. Lithgow is the topic for the January 18 meeting of the Bethlehem Historical Association. Bob Mulligan and Randy Patten will present their illustrated talk at 2 pm on January 18 at the Delmar Reformed Church, 386 Delaware Avenue, Delmar. A prolific artist, Lithgow (1868-1959), was a painter, sculptor and muralist whose works are scattered about Albany. You might have seen his murals behind the Native American exhibits at the New York State Museum or on the walls of Milne Hall at the downtown campus of SUNY Albany. The Spanish American War Memorial at Townsend Park features a sculpture of striding soldier created by Lithgow. He was acquainted with Bethlehem notable J. B. Lyon, whose Cedar Hill estate boasted three Lithgow paintings of Hudson River scenes, one of which is on display at the schoolhouse museum. The lecture is free and open to the public with refreshments to follow the talk. All welcome! Please make note the venue and time change! The Bethlehem Historical Association invites one and all to come to the Cedar Hill Schoolhouse for our annual Silver Tea and Holiday Open Houses. Enter into the holiday spirit and enjoy the schoolhouse decorated in Victorian splendor with the theme Twas the Night Before Christmas. The Silver Tea is Sunday, December 3 from 1 to 4 p.m. Visitors will enjoy tea from our elegant silver service accompanied by treats and delicacies. We have two Open Houses this year: Monday evening December 4 from 4 to 8 p.m. and Sunday afternoon December 10 from 1 to 4 p.m. Both open houses feature light refreshments and a time to experience our wonderful decorations. All of these holiday events are free and open to the public. Come see the museum all decked out for Christmas! The Cedar Hill Schoolhouse Museum, home of the Bethlehem Historical Association, is located at 1003 River Road, Selkirk. The Erie Canal is the topic of the November 16 lecture at the Bethlehem Historical Association. Craig Williams presents “Mapping David Vaughan’s Erie Canal” at 7:00 PM at the Cedar Hill Schoolhouse Museum, 1003 River Road, Selkirk. Craig Williams recently retired after thirty years as a senior historian at the New York State Museum. He also served as the director of the DeWitt Historical Society of Tompkins County in Ithaca and was the curator of the Erie Canal Museum in the late nineteen seventies. The lecture is free and open to the public. Join us afterwards for refreshments and conversation. Pictured below is a portion of Vaughan's 1857 map of the canal near Boonville. Dr. Michael Lucas presents his talk Slavery and Freedom for the Bethlehem Historical Association at 7 PM on Thursday, October 19 at the Cedar Hill Schoolhouse Museum, 1003 River Road, Selkirk. Enslaved people of African and Native American descent were used as the primary labor force in New York until gradual emancipation abolished the institution in 1827. Although the number of slaves per household was smaller in New York than southern plantations, several wealthy landowners retained over 5 slaves on their rural estates, including the Nicoll-Sill house in Bethlehem. Dr. Lucas’ talk will look at what history and archaeology tell us about the strategies used by these families during the transition from slavery to freedom. Michael Lucas is the Curator of Historical Archaeology at the New York State Museum. He received his Ph.D. in American studies from the University of Maryland. In addition to his studies on slavery and its aftermath in the Hudson Valley, he also conducts comparative research on eighteenth century development of New York City and Albany using the historical archaeology collections at the museum. Pictured above is Caesar, who was a slave on the Nicoll-Sill property. The New York Historical Society holds the original Daguerreotype. Thank you for a great run of history hikes this season! We had fun exploring Henry Hudson Park, Slingerlands, Delmar, Selkirk, South Bethlehem and Normansville. Our doors are open Sunday afternoons until October 29! The Bethlehem Historical Association's Cedar Hill Schoolhouse museum currently features Bethlehem 100 Years Ago. Bethlehem 100 Years Ago takes a particular look at what our town was like during World War I. Highlights include the Woman’s Land Army farm in Selkirk and the WWI veterans that honored their fallen comrades annually as part of the Last Man’s Club. Our center exhibit area recreates a kitchen scene circa 1917. Military memorabilia is also be featured. The Cedar Hill Schoolhouse Museum is located at 1003 River Road in Selkirk and is open Sunday afternoons from 2 to 4 PM June 11 through October 29. Admission is free. You are invited to participate in something completely different. Sunday, July 23rd, the Bethlehem Historical Association will host a World War I tabletop battle to coincide with their summer exhibition about Bethlehem's participation in that war a century ago. Players of any age (under 12 with an adult) should show up at the Cedar Hill School on Route 144, about 2 pm Sunday afternoon, to command a battleship of the US Navy, or one from the Imperial German High Seas Fleet. The ships are tiny, but the rules are easily learned, and give a very good idea of what battle in the mists and smoke of the North Sea was like. On Sunday afternoon September 24th, 2-4 pm, there will be another tabletop war-game, again, easily to learn and for all ages. This time players will take to the skies over the Adriatic Sea as pursuit planes and bombers of Italy's Regia Aeronautica. They’ll battle it out with the fliers of the Imperial and Royal Austro-Hungarian Luftfahrtruppen. The tiny 1/144 scale planes are a colorful reminder of just how drab modern air combat has become. And how impersonal. Perhaps you will have time to learn a few interesting facts about Italy's famous ace Francesco Barraca, or Austria's Godwin Brumowski. For further information or to reserve a spot at the table, please call Robert Mulligan at 439-3802. Steve Trimm portrays Ulysses Grant at the September 21 meeting of the Bethlehem Historical Association. General Grant's famed Memoirs are almost entirely about his service in the Mexican War and the American Civil War. But as he reflected on his military career, he also looked back on his youth, his experiences as a husband and father, mistakes he had made, lessons he had learned, his moral growth and how he came to discover what truly matters in life and what doesn't. He did not write about any of these personal things in his Memoirs. But at the Cedar Hill Museum he will talk about them. And it's guaranteed that you will be surprised (and have your heart warmed) by stories that will reveal a Ulysses S. Grant the public never knew. Trimm has been doing “living History” portrayals of Grant for 9 years and has been a tour guide at Grant Cottage State Historic Site for 10 years. All are welcome on Thursday September 21, at 7 PM, to come to the Cedar Hill Schoolhouse Museum, 1003 River Road Selkirk, and meet General Grant. The event is free and refreshments served. Presenter Robert Mulligan explores the life of World War I era soldiers in his illustrated talk “Sammy Doughboy Remembers.” Images are drawn from the New York Times Rotogravure section, taken and published during the war. These pictures, together with the narrated comments, explain what the typical soldier from New York state saw and experienced during his time in the army, and while overseas. Questions are encouraged, and there will be a small display of World War I relics as well. volunteer in a clipping from an ad that ran in the May 16, 1919 issue of the Ravena News Herald. We had a great time history paddling this summer. We'll do them again next year! The rich sound of a Meneely bell can be heard from several Bethlehem churches. Founded in 1826 in West Troy (now Watervliet), the Meneely Bell Foundry made over 65,000 bells before closing in 1952. Learn more about this iconic Capital Region company at the Bethlehem Historical Association on Thursday April 20, at 7 p.m. at the Cedar Hill Schoolhouse, 1003 River Road, Selkirk. Our speaker, Michael Barrett, is the Executive Director of the Hudson Mohawk Industrial Gateway and the Burden Ironworks Museum in Troy. He is a member of many of the local historical organizations and has given talks and, or led tours, for over one hundred thirty groups. Free and open to the public. Refreshments and conversation following the talk. Please come and bring a friend! How many folks have driven over Albany’s Dunn Memorial Bridge without a thought to the person it is named after? Historian Mark Bodnar shares the story of World War I Congressional Medal of Honor recipient Parker Dunn at the Bethlehem Historical Association’s March meeting. The lecture takes place at the Cedar Hill Schoolhouse, 1003 River Road, Selkirk at 7 PM on Thursday March 16. Free and open to the public. Refreshments and conversation following the talk. Please come and bring a friend! Note: The image below is from the Albany Postcard Project. Visit their website for lots of fun postcards. Marilyn Sassi presents Dutch Architecture and Furnishings on Thursday, February 16, at 2 PM at the Delmar Reformed Church, 386 Delaware Avenue, Delmar. Fort Orange was built by the Dutch at the same early date the English were landing at Plymouth Rock. Nothing remains in either location from those first houses built circa 1620, however both the Hudson and the Mohawk Valleys contain a number of fine examples of Dutch architecture from the early 17th and early 18th centuries. The focus of the lecture will be on the earliest houses that were built either as urban dwellings or rural homesteads. Several of the homes that have been fully restored from the inside out highlighting their unique Dutch features. The lecture will end with one of a kind examples of furniture these homes contained and illustrate how they differ in their designs and forms from their New England counterparts. ​ Marilyn Sassi is currently an adjunct instructor at Schenectady County and Hudson Valley Community Colleges. She has also presented series for U-Call at Union College. Marilyn is the past curator of the Schenectady County Historical Society, the Fulton County Museum and the Van Alstyne Homestead Society. In addition, she has had many years of involvement in the field of antiques. Programs of the Bethlehem Historical Association are free and open to the public. Refreshments will be available following the talk. Please come and bring a friend! Joe Ferrannini of Grave Stone Matters is the speaker for the Bethlehem Historical Association’s January 19, 2017 meeting. Ferrannini is an expert on cemetery preservation and the conservation of stone monuments. He will share his passion for the history to be found in cemeteries. The lecture takes place at 2 p.m. on January 19 at the Delmar Reformed Church, 386 Delaware Avenue, Delmar. Free and open to the public. Please note the change in our regular location! Sunday afternoon December 4 from 1 to 4 p.m.
with a special visit by Sinterklaas between 1 and 3. Monday evening, December 5 from 4 to 8 p.m.
Every year for more than 20 years, the creative volunteers at BHA have transformed the The Cedar Hill Schoolhouse for the Christmas season. This year our theme is Walking in a Winter Wonderland . All are welcome to experience the lavish decorations and enjoy the generous refreshments during our annual Silver Tea on December 4 and our Open House on December 5. The Silver Tea, from 1 to 4 pm on the 4th, features a full hot tea service as well as coffee, punch, and a wide assortment of holiday goodies. As a speical treat, Sinterklaas will join us between 1 and 3. The Open House on Monday evening from 4 to 8 p.m. is a chance to enjoy the decorated schoolhouse in a more relaxed way. Might we suggest a ride through the Bethlehem countryside for a look at all the Christmas lights and a stop at the schoolhouse for cookies and punch? Both events are free and open to the public. Come join us! Surviving winter is the topic for the November meeting of the Bethlehem Historical Association. Shelby Mattice, curator of the Bronck Museum, presents her talk Chilly Willy’s Winter’s Eve which looks at how the early Dutch settlers of the rural Hudson Valley survived the harsh reality that is an upstate New York winter. All are welcome for the talk on Thursday, November 17, 7 p.m. at the Cedar Hill Schoolhouse, 1003 River Road, Selkirk. Free. Refreshments and conversation will follow the talk. In the photo below, circa 1910, some folks from South Bethlehem deal with winter by going for a ride on a sled. Thank you for a successful run of History Hikes this year. See you again in 2017! Does the night watchman who died in the Capitol fire of 1911 still make his rounds? Which two United States Presidents visited the Capitol after they died? Does the secret demon carved in stone hold a Capitol Curse? New York State’s iconic capitol building has its share of mysteries. Stuart Lehman, Education Coordinator for the New York State Capitol, will explore these and other ghostly tales at the Bethlehem Historical Association’s next meeting on Thursday, October 20, 7 p.m. at the Cedar Hill Schoolhouse, 1003 River Road, Selkirk. All are welcome. Free. Refreshments and conversation will follow the talk. While researching his book on Hudson River steamboats, Tom Allison discovered that the Circus owes a lot to Albany and one man in particular, Gilbert Spalding. Circus trains, bleachers, even the set up at every venue was his invention. Allison will explore this fascinating local connection at the Bethlehem Historical Association’s next meeting on Thursday September 15 at 7PM. The lecture takes place at the Cedar Hill Schoolhouse, 1003 River Road, Selkirk. All are welcome. Free. Refreshments and conversation will follow the talk. Presenter Tom Allison is a 40-year resident of Albany who enjoys discovering the story of his adoptive town. Most of it has been filled in, paved over, and forgotten but every once in a while, something long forgotten like this circus connection comes to light. Allison is the author of Hudson River Steamboat Catastrophes. 2016-2017 Program Program Calendar is here! Click on the Events & Activities tab for a full listing. The Bethlehem Historical Association celebrates the opening day of our summer exhibit Parade of Fashion 1860s to 1960s with a free ice cream social on Sunday, June 12 from 1 to 4 PM at the Cedar Hill Schoolhouse, 1003 River Road, Selkirk. All are welcome! Over the winter, BHA did a complete inventory of their textile and clothing collection and re-discovered a treasure trove of apparel and accessories for men, women and children. This year’s summer exhibit, Parade of Fashion 1860s to 1960s, highlights these wonderful items. THANK YOU for a great summer - we had record breaking attendance! The schoolhouse is now open by appointment and for our regular program meetings. Many thanks to all who participated in our history paddle last night. Despite the heat and threat of storms, we had 11 boats on the water and had a nice paddle along the Hudson and Vlomankill. We'll do it again next year! This Saturday, June 25 at 10 AM blacksmith Jim Moran will be demonstrating at the forge at Norman's Kill Farm Park. Last fall he gave an excellent talk at the schoolhouse which left us all anxious to see him in action. Please feel free to stop in. All are welcome for this free demo of the blacksmith trade. DIRECTIONS to Norman's Kill Farm Park: Take Delaware Avenue towards Albany. Pass Tastee Freeze and go over the high bridge. Just after the bridge, turn right onto Mill Road. You'll see a sign for a veterinary clinic and, if your eye is sharp, a sign for the park with a red anvil below it. If you reach the stop light by the cemetery you've gone to far. Follow Mill Road around under the bridge. The parking lot is just up on the left. Park and walk up the road to the blacksmith shop. It will be on your left. Scroll down for a picture of Jim at the forge. Town historian Susan E. Leath is pleased to announce the publication of her new book Historic Tales of Bethlehem, New York. The book dips into hundreds of years of local history from pre-historic Native Americans, to the early Dutch settlement era; from our agricultural heyday to post World War II suburbanization. Articles feature historic locations all over the town of Bethlehem including the hamlets of Delmar, Selkirk, South Bethlehem, Cedar Hill, Slingerlands and Normansville. It explores recognizable local landmarks such as the Adams House in Delmar and the Cedar Hill Mansion in Selkirk. Readers will learn about the families that gave their names to such familiar hamlets as Slingerlands and Selkirk, the street names of Groesbeck and Winne, and water ways like the Hudson River and the Normanskill. Historic Tales of Bethlehem, New York, published by the History Press, is available for sale at the Town Clerk’s office at Town Hall, I Love Books in Delmar, Tattered Pages in Glenmont, and many other retailers including online. All of the author’s royalties are donated to the Bethlehem Historical Association. Thursday evening May 19, beginning at 7 PM, is our annual membership meeting. Business includes the election of officers and trustees, presentation of the president's annual report and presentation of the budget for the upcoming year. Enjoy a special dessert buffet after the meeting! On Thursday, April 21 at 7 PM Michael Engle will present an illustrated talk about diners in Bethlehem and the Capital District. Engle has been researching diners since 1996. A faculty member at HVCC, he co-authored “Diners of New York” and wrote “Diners of the Capital District.” His current project focuses on the history of diners in the Great Lakes states. He is passionate about Capital District diners and those built in western New York between 1921 and 1950. The lecture takes place at the Cedar Hill Schoolhouse, 1003 River Road, Selkirk. All are welcome. Free. Refreshments and conversation will follow the talk. Following the talk, town historian Susan Leath will be available to sell and sign her new book Historic Tales of Bethlehem, New York. Please join us at the Cedar Hill Schoolhouse on Thursday, March 17, 2016 at 7 PM. John Wemple, Jr will present a talk about the Wemples of Bethlehem. Come and find out more about a prominent Bethlehem family now remembered in the name Wemple Road. The event takes place at the Cedar Hill Schoolhouse, 1003 River Road, Selkirk. All are welcome. Free. Refreshments and conversation will follow the talk. The above map is from 1891 and shows what was the hamlet of Wemple along today's Wemple Road. Following the talk on the 17th, town historian Susan Leath will be available to sell and sign her new book Historic Tales of Bethlehem, New York. On Thursday, February 18 at 2:00 PM performer Bonnie Mion presents a talk and storytelling about Women’s Suffrage that includes the suffrage activists in our local and regional area. During her research, Mion was pleased to discover that two of her great grandparents were active suffragists working as organizers, fundraisers and speakers. Her great grandfather, Nathaniel Schmidt, was often an honored speaker, giving talks and holding tent meetings alongside such leading lights as Susan B. Anthony, Carrie Chapman Catt, Reverend Anna Shaw, and Harriet Mills May. Bonnie Mion is professional dancer and storyteller and a retired psychotherapist. She is a member of the Storycircle of the Capital District and the Capital Advanced Toastmasters. The talk will be held at the Delmar Reformed Church, 386 Delaware Avenue, Delmar. All are welcome. Free. Refreshments and conversation will follow the talk. Please note the venue change from our usual location. On Thursday afternoon January 21 at 2 PM the Bethlehem Historical Association presents Gene F. Gore’s talk The Northern Home Front in the Civil War. Gore will draw from his knowledge of his Tufts and Newman family ancestors using them to explore the common experience of Northerners during the Civil War. Gore is currently writing about his great uncle, Caleb Tufts. Tufts was a Union soldier with the 31st and 27th Massachusetts, was captured at the Battle of Drury’s Bluff near Richmond, VA and was held in four different Confederate prison camps. Tufts survived the war and died at age 78 in 1919. Gore has identified eight other ancestors who were Civil War soldiers. He is a member of the Bethlehem Historical Association, the Hatfield Massachusetts Historical Society, and the Capital District Civil War Round Table. The lecture will be held at 2 PM on January 21 at the Delmar Reformed Church, 386 Delaware Avenue, Delmar. All are welcome. Free. Refreshments and conversation will follow the talk. Please note the venue change from our usual location. The above illustration is from the book Twenty Million Yankees:the Northern Home Front, volume 14 of the Civil War, Time-Life Books. Join us and see the schoolhouse all dressed up for the holiday season. Cozy Plaids and Sparkling Lights is the theme. Come Sunday for the Silver Tea and tea time treats. Enjoy the decorations on Monday along with punch and cookies. Both days are 1 to 4 PM and are free and open to the public. Blacksmith Jim Moran presents Blacksmithing: Yesterday and Today at the Bethlehem Historical Association’s monthly meeting on Thursday, November 17 at 7 PM at the Cedar Hill Schoolhouse, 1003 River Road, Selkirk. Moran has been blacksmithing for over 40 years. Many weekends he can be found at the forge at the Norman’s Kill Farm Park working and shaping iron and steel into useful objects. He is an active member of the Capital District Blacksmiths Association and enjoys sharing the blacksmithing skills he has acquired over the years. All are welcome; free and open to the public. Join us for refreshments and conversation after the talk. Below: Jim Moran adds coal to the forge at Norman's Kill Farm Park. History Hikes - See you in the spring! Explore the history of Bethlehem's hamlets including Delmar, Slingerlands, South Bethlehem, Selkirk and Cedar Hill. History Hikes are led by Susan Leath, Bethlehem's town historian and will resume in May 2016. Sponsored by the Albany County Historical Collaborative in honor of New York State History Month, this talk takes place at 7 PM on Wednesday November 4 at the Delmar Reformed Church, 386 Delaware Avenue, Delmar. Free and open to the public. Inventors and Inventions of the Capital District overviews the importance of the Capital District as the 19th century "Silicon Valley" of the East. Mr. Rittner will give an illustrated talk about a number of inventions and inventors that reveal how important our area was in the development of American Technology and its impact over the last 200 years. The Capital District is one of the oldest continually settled areas in the United States and many of the everyday items we take for granted, such as fluorescent lights, were invented here. Albany, Schenectady and Troy were major industrial powerhouses during the 19th century. Celebrate BHA's 50th anniversary and Archives Month by visiting the Bethlehem Public Library and enjoying an exhibit of Bethlehem images from the 1950s and 60s. The show continues until October 31, 2015. Bethlehem Historical Association members are invited to read the draft bylaws presented at the September 17, 2015 membership meeting. Please click here Documents to go to the PDF. UPDATE: Thank you BHA members. The By-Laws were approved at the Sept. 17 meeting. BHA begins their new program year with a talk by New York State Archaeologist Dr. Christina Rieth. Dr. Rieth will speak about Twenty-first Century Archaeology in New York State. Join us on Thursday evening September 17 at 7 PM at the Cedar Hill Schoolhouse, 1003 River Road, Selkirk. Refreshments and conversation to follow. Free and open to the public. Dr. Reith oversees a collection of over 4 million items of Native and Euro-American manufacture. It includes the largest Dutch Colonial archaeological materials in North America. Her research of late Prehistoric populations of the Northeastern United States and Canada has led to greatly increased understanding of the movement of settlements, their trade and interactions with their environment and each other. The 2015 - 2016 Program Calendar is here! The Bethlehem Historical Association’s Cedar Hill Schoolhouse museum highlights a variety of exhibits this summer. Circa 1965 looks back at the Town of Bethlehem during the era in which the organization was founded. It features photographs and memorabilia from around town as well as colorful posters from the Slingerlands Players. One Hundred Years Difference: Clothing from 1865 to 1965 explores 100 years of changing clothing styles. The adjacent Toll Gate building features What’s All the Buzz, a look at bee keeping. The exhibit continues through August 30, 2015 with the museum open Sunday afternoons from 2 to 4 PM. All are welcome to join us Opening Day Sunday, June 14 from 2 to 4 pm, for a free Ice Cream Social. Make your own sundae courtesy of Stewarts Shops. The History Paddle this Saturday is FULL! Questions about the tour can be directed to Susan Leath, sleath@townofbethlehem.org. Arrive at the park with enough time to be on the water by 9 am sharp. Our Fiftieth Anniversary Dinner Meeting will be at the Mansion at Cedar Hill on Thursday, May 21. Doors open at 5:30, dinner is served at 6:30 with the annual meeting to follow. Please contact Kathy Newkirk at 767-2980 to reserve your spot. The cost is $20 per person. Are you researching a Bethlehem family? Join us at the Bethlehem Public Library, Tuesday May 12 at 7 pm, to learn about local resources. Presenters are town historian Susan Leath and BPL librarian Frank Somers. Thursday April 16, 7 PM is our regular monthly meeting. As we celebrate our Golden Anniversary, we’ll be reminiscing about BHA’s 50 year history with charter member Norma June. We’ll also have on display photographs of Bethlehem circa 1965. Join us for a trip down memory lane! Bring those items that you think might be valuable to the Bethlehem Historical Association’s second annual Antiques Appraisal Day to be held at Bethlehem Town Hall on Saturday, April 18, 2015 between 10 AM and 2 PM. This year our professional appraisers are Russell Carlsen, Deirdre O’Callaghan and Lynne Phelps. Russell Carlsen is the proprietor auctioneer of Carlsen Gallery Inc. Antiques in Greenville. Carlsen has been conducting auctions of estate merchandise and antiques in the upper Hudson Valley and Albany area since 1984. The gallery is one of the oldest established auction services in this area and specializes in 18th and 19th century American furniture and accessories including oil paintings, furniture, porcelain, and Oriental rugs. Deirdre O’Callaghan is the owner of Partridge Hill Antiques which has two locations in Ballston Spa – Stone Soup Antiques and the new Doubleday House Antiques. She is the third generation of women antiques purveyors, following her grandmother and mother. O’Callaghan has particular interest in the areas of American and European silver, pottery, furniture and small items. Lynn Phelps, a Bethlehem resident, has been a specialist in antiques and costume jewelry for 30 years. Each item will be appraised for $6 each or three items for $15. All proceeds will benefit the Bethlehem Historical Association and especially its efforts to preserve artifacts relating to the Town of Bethlehem. Members of BHA with long-held expertise in a variety of areas will also be on hand to advise attendees. Galen Ritchie has an encyclopedic knowledge of coins and stamps. He is a long time member of the American Philatelic Society, the American Numismatic Association and the American Numismatic Society. Arthur Young is also highly qualified to evaluate stamps and first day envelopes, as well as provide assistance with genealogy questions. Ann Vandervort is well-known as a specialist in general 18th and 19th century items, particularly dolls. Rob Halley, another long-time collector and dealer, will again be on hand to display and explain fascinating antiques from the Hudson Valley region. In addition, there will be an opportunity to purchase quilt raffle tickets. David Chinery will speak about the Lighthouses of the Hudson River during the Bethlehem Historical Association’s March meeting. The date is Thursday March 19, 2015 7 PM. The place is the Cedar Hill Schoolhouse, 1003 River Road, Selkirk. Free and open to the public. Chinery’s illustrated program provides a brief look at lighthouses on the Hudson River in order going north, starting at New York City, and includes lighthouse which still exist today as well as those no longer standing. Chinery will explore the history, characteristics and operations of each lighthouse and some of the most notable lighthouse keepers. David Chinery is a resident of Schodack, NY and is the president of the Historical Society of Esquatak. He earned degrees in Plant Science from Rutgers University and Ohio State University, and is the horticulturist for Cornell Cooperative Extension of Rensselaer County. 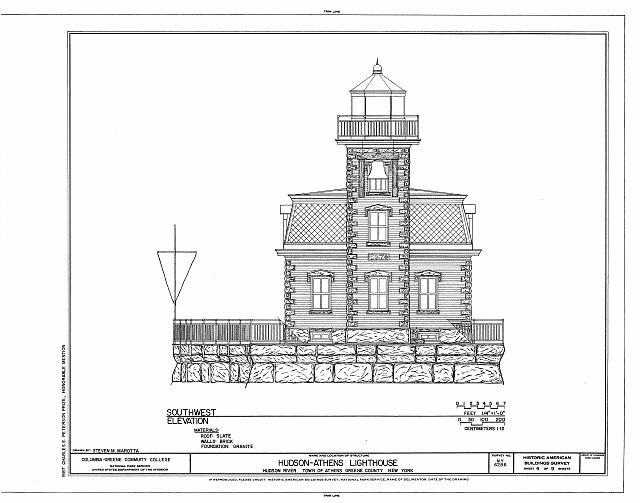 Below is the Hudson Athens Lighthouse from the Historic American Building Survey. The modern understanding of New York State prehistory was principally arrived at through the research of archaeologists Arthur C. Parker, William A. Ritchie, and Robert E. Funk. With his talk entitled Three Twentieth Century Archaeologists Who Revealed the Prehistory of New York State BHA member Galen Ritchie will discuss what they did and how they did it. All are welcome to our regular monthly meeting Thursday February 19 at 2 PM at the Cedar Hill Schoolhouse, 1003 River Road, Selkirk. Free and open to the public. BHA is pleased to announce that the Cedar Hill Schoolhouse museum will be OPEN every Sunday afternoon from 2 to 4 during the month of February. Enjoy a slice of local Bethlehem history with our new exhibits. No admission charge. Due to the harsh weather forecast for this Sunday, February 15, 2015, the museum will NOT be open. Hope you are enjoying our good, old-fashioned winter this year! All are welcome to our regular meeting on Thursday, January 15, 2015 at 2 PM. The program will feature Bill Brandow, Project Manager John G. Waite Associates, Architects in Albany, talking about "Governor Martin H. Glynn of Albany and Bethlehem." As always, free and open to the public. This meeting WILL take place at the Cedar Hill Schoolhouse. We had plans to meet at Glynn's summer home across the street from the schoolhouse, but those have fallen through. Below: Gov. Glynn (right) leaves the capitol with Sec'y Tierny. Free and open to the public. All are welcome to come down to the schoolhouse and catch some holiday spirit! On Thursday, November 20 at 7 PM Albany City Historian Anthony Opalka and Bethlehem Town Historian Susan Leath will illustrate how the boundary line between Albany and Bethlehem has changed over the years. The City of Albany evolved from Fort Orange and Beaverwyck; Bethlehem from Rensselaerswyck Manor and the Town of Watervliet. Bethlehem was divided in 1832 to form the Town of New Scotland and Albany has annexed many sections since then. Discover more during Opalka and Leath’s talk at the Cedar Hill Schoolhouse, 1003 River Road, Selkirk. Free and open to the public. “people of the waters that are never still"
During our regular monthly meeting Bethlehem resident Emerson Martin, Jr. will frame his talk about his ancestors, the Mohicans, with a series of questions. Who are we? Where are we from? What are we doing here? What did we do? Are we still here? Martin is a sanctioned Mohican Veteran with Native American ancestry on both his grandmother and grandfather’s sides of the family. The meeting takes place on Thursday October 16 at 7 PM at the Cedar Hill Schoolhouse Museum, 1003 River Road, Selkirk. Come early for a look at the museum displays and stay late for refreshments. Free and open to the public. Our first regular meeting of the new program year features Denis Foley speaking about the notorious prohibition era gangster Jack "Legs" Diamond. Diamond's attorney Dan Prior lived across the street from the Cedar Hill Schoolhouse. The meeting is Thursday September 18, 2014, 7 pm at the Cedar Hill Schoolhouse, 1003 River Road, Selkirk. Free and open to the public. NOTE: The complete listing of 2014-2015 programs can be found by clicking the Events & Activities button on the left. We had a great time this summer sharing Bethlehem history with our visitors! Join us for our regular meeting on Thursday April 24 at 7 PM for a talk by noted local author Paul Grondahl about the Corning Estate. The meeting is at the Cedar Hill Schoolhouse, 1003 River Road, Selkirk, and is free and open to the public. At our regular meeting on Thursday March 20, 7 PM at the schoolhouse, Brian Parker and Bill McMillen will update us about the Winne Creble House. The house was built about 1720 by Pieter Winne. Winne was baptized at the Albany Reformed Church in 1699 and married Rachel VanAlen on January 21, 1720. They raised seven children here. The home stayed in various branches of the Winne family until it was purchased by Harris and Katherine Creble who owned it from 1906-1966. Brian Parker purchased the property in 2000 and has been working on its restoration. The home has many unique Dutch features. The stone ell was added in 1750. The museum will be open Sundays in February from 2-4 in the afternoon. As always a visit to the museum at the Cedar Hill Schoolhouse is free. Families are welcome and we are featuring a Please Touch Table. The dates are Feb. 2, 9, 16 & 23. Presenting at our regular meeting on Thursday February Feb. 20 at 2 PM are Dr. & Mrs. Stuart C. Lyman speaking about Working With Farm Animals. You might be familiar with their farm on Meads Lane. Instead of a regular meeting at the schoolhouse, we are trying something new in January - a trip to Schuyler Mansion. The date is January 16, 2014, 2 pm. About 25 of us visited Schuyler Mansion yesterday. Going on a "field trip" was a nice change of pace. Please join us for our annual Silver Tea this Sunday and Monday. Drop in between 1 and 4 PM and enjoy the decorations and savor the treats. All welcome. Free and open to the public. Randy Bushart and David Hamilton tell us about the Selkirk Yards and Nearby Railroads on Thursday, November 21, 2013, 7 pm at the Cedar Hill Schoolhouse. Thank you for a great History Hike season. We'll be back in 2014! Town Historian Susan Leath makes a point during November's history hike in Delmar. Five Rivers, the History of a Special Place is the topic for our next meeting on Thursday October 17, 2013, 7 pm at the Schoolhouse. Presenter is Co-author Rose Ann Fogarty. It is here! Click on the Events and Activites button at left to make the jump for the complete listing. PLEASE NOTE THE TIME CHANGE FOR THE MEETING - 7:00 PM except in January and February. We'll be open June 23rd for our summer exhibit from 2-4 pm. Come join us for a relaxing afternoon listening to the "Rural Felicity" singers and of course a dish of ice cream compliments of Stewart's Shops. The center of the museum will be transformed into a park like setting that will showcase our newly acquired clothing from the 1890s. We look forward to an interesting and colorful summer exhibit. Our annual meeting this year is May 16, 2013, 7:30pm at the schoolhouse. Officers for the year 2013-14 will be elected. We'll also enjoy a program by John Anson called "Fire Engines, Mastodaon and Batteau: My Career at the New York State Museum." Join us! Free and open to the public. Matthew J. Kirk will enlighten us about the deeds of Captain Stewart Dean during and after the American Revolution. Thursday April 18, 2013, 7:30 PM at the Cedar Hill Schoolhouse. Free and Open to the public. "Sparks from the Captial Fire of 1911" is the title of Stuart Lehman's talk scheduled for 7:30 pm Thursday March 21, 2013. Join us! Free and open to the public. Join us on Thursday, February 21, 2013 at 2:00 pm to hear Judge W. Dennis Dugan's talk "Lincoln in Albany: The Strange, Twisted and Mysterious Connections Between NY's Capital, Ford's Theater and Garrett's Farm." The Cedar Hill Schoolhouse Museum will be open Sunday afternoons from 2 to 4 PM on February 3, 10, 17 and 24, 2013. Bring the family. Admission is always free. Featuring our winter exhibits: Toys from the Attic and Ice Harvesting on the Hudson plus a "touch table" where you can examine old and new objects. Karen and Kathleen with the Please Touch Table. The schoolhouse was built in 1859 as a one room school for District No. 1. In 1907 it was redesigned by Marcus Reynolds into the present two room configuration. Indoor plumbing and electricity were added. The building was used as a school through 1962. In 1965, the Bethlehem Historical Association was chartered and the museum opened. Town historian and BHA member Susan Leath has learned more information about the Winne family photo on the cover of her new book Bethlehem. The women across the front are, from left to right, Alice, Nancy, May, Ida and Adeline. All have the last name Winne. In the rear on left is Esley Winne, father of John (on the horse), Nancy and May. The three young men on the right are, from left to right, Amos, Aaron and Jessie, possibly step sons of Esley. Esley’s family home still stands near the former Winne Lane (now Village Drive). It currently has a Carriage Road address. Bethlehem is on sale now at the Bethlehem Town Clerk’s office, I Love Books, Tattered Pages and other local and online retailers.